iTRACK is an online pupil tracking software that uses powerful data analysis to track your students’ progress and attainment in real time. What distinguishes iTRACK from other systems is how easy it is to use and be tailored to your school’s profile. It is tried and trusted by schools nationwide, in fact, 90% of schools using iTRACK are Ofsted rated good or outstanding. 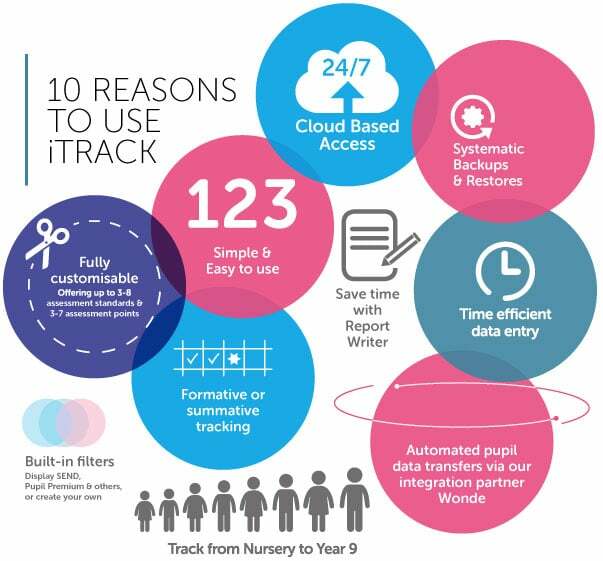 iTRACK is an innovative online pupil tracking system that enables you to track your pupil progress and attainment in an easy-to-use and time-saving way. iTRACK includes both formative and summative pupil tracking and includes all core and over 20 foundation subjects. It is one of the most flexible and adaptable school pupil tracking systems on the market. It offers complete flexibility in the number of and terms used to describe the assessment standards used for reporting “without levels”. Furthermore, it benefits from daily updates from management information systems such as SIMs and Integris, inbuilt school report writers, pupil reports showing progress and attainment, pupil flight paths and whole-school tracking covering tracking teacher assessments, scaled and standardised scores. iTRACK ensures your pupil data is always secure, well managed and clearly presented. Designed by teachers, for teachers, iTRACK supplies you with helpful tracking reports, so you can pinpoint precisely where to focus your teaching strategies. iTRACK is also conveniently cloud-based, so you can securely access important pupil data whenever and wherever you like. Unlike many systems that were designed for tracking “levels”, iTRACK was designed to track “without levels” and for the 2014 National Curriculum.This means that the system enjoys much greater flexibility and pupil tracking can be measured in either a linear way (the traditional approach), or a non-linear way where pupils are assessed on the quality of work at any assessment point. And if they keep it up throughout the year, they will be judged to be “on track” to achieve. To find out more about iTRACK, see our systems in action, or to arrange training, call our friendly team on 01926 468687 – we’re always happy to chat!